Features an analysis of our numbed response to images of horror. This title alters our thinking about the uses and meanings of images, and about the nature of war, the limits of sympathy, and the obligations of conscience. I can't remember exactly where I heard about this book, but I knew I needed to read it. My particular interest centered on a conversation I'd had with a friend several years ago that has really stuck with me. We were discussing the ownership of printed materials that could be seen as offensive/socially subversive. Her family owned a first edition copy of Mein Kampf in German. My family owns a photograph of a lynching that took place in the small Southern town where my father grew up. 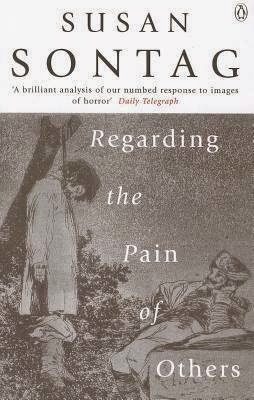 When I realized that one of Sontag's essays in this book actually addresses the exact kind of photograph I have - a photograph of a lynching that was taken and sold as a postcard to the white citizens - I knew it was a book I'd have to read. This short collection of essays certainly packs a punch. I was familiar with Sontag as a prominent feminist author, but I hadn't read any of her social criticism. I'm so glad I picked up a copy of this, because it's beautifully done and examines exactly the ideas surrounding the issues of viewing the pain of others, particularly in photographic form. Some of the essays take on the historical ways we've viewed pain in paintings and, in more recent years, in photographic form. She discusses the first wars in which photography of carnage was made available to the public. She also looks at the issues from a psychological and ethical standpoint, detailing how the elements of sensationalism and the need to document atrocities often are so interconnected that they can't be separated. It's incredibly well done, but also largely readable. It's short and to the point, so you won't feel as if you're taking on some endless academic tome, although I do have to point out that this is very academic in nature. It's as difficult to read this as it is to read any historical account of atrocities and not something you really want to speak about in terms of being entertained. At the same time, that very conundrum is exactly what is being tackled in the book. We want to say we are not entertained by images (or stories) of the suffering of others, yet we don't stop ourselves from looking (or reading). If there weren't some element of interest, we wouldn't bother. Because I was particularly interested in the topic, I gobbled this up. But I think that it's going to have a limited audience due to the academic nature of the writing. It's not necessarily an easy read or something that you would pick up on a whim. If the subject interests you and you don't mind putting some effort into the mental work of reading a more academically-minded text, however, this is very well done. It's definitely for those who want something intensely academic and requires the brain to work. But it's also something that I think will stay with you and keep you thinking, just like my conversation with my friend has stayed in my mind for years.